results from an increase in temperature in urban environments with reduced vegetation cover), also mitigating heat loss during the winter; contribute to biodiversity; increase carbon sequestration, improving air quality; improve the soundproofing of buildings; increase the durability of roofs and the lag spread of potential fires. requires the installation of an irrigation system. The advantages of green roofs in arid climates will only be sufficiently extended if the system is cheaper and sustainable. Thus, in the current proposal we intend to develop a biological material production technology as green cover that does not depend on irrigation water. Dry areas as the deserts are covered with biological soil crusts (biocrusts), composed of a complex mosaic of cyanobacteria, green algae, lichens, mosses, microfungi and other bacteria. These communities are able to photosynthesize when water is available, but in drought conditions, photosynthesis and the entire metabolism ceases. Biocrusts can remain under these conditions for long periods of time from months to years, and return to its normal functions after rain/dew events. The cyanobacteria and microfungi weave filaments that form a matrix (working as glue) that protects and stabilizes the soil surface against erosive forces, while contributing to the creation of new abiotic conditions that allow the establishment of more complex organisms, such as mosses. The moss dominated biocrusts are candidates for addressing the issue in focus in this proposal, also focusing on the aesthetic value of the building/urban structure. Furthermore, mosses appear as an innovative solution to urban landscape since this taxa does not have a root system, thereby reducing the thickness of the substrate, decreasing the installation costs and the weight load on the structure on which is applied, also allowing to explore the vertical dimension of buildings, something that cannot be used by other types of plants without using irrigation. The resulting product of this biological technology applied to urban landscape may be designated MedMossRoofs. This technology can help to create a solution aimed for urban environments, benefiting from reduced water needs of moss dominated biocrusts in order to: i) eliminate the need for irrigation; ii) reduce the weight load on buildings; iii) benefit from moss adaptations to extreme drought, while maintaining its aesthetic value; iv) avoid the use of exotic species and prevent the development of invasive species; v) promote biodiversity in urban areas; vi) assess the rainwater retention, avoiding the typical floods of highly impermeable urban areas; vi) assess the environmental services provided. The main objective of the project will be to explore the use of moss dominated biocrusts as a solution to the green roofs of urban landscape avoiding irrigation, based on a diversity of native moss species retrieved from different locations in Portugal reflecting different climatic conditions and thus different adaptations and tolerances to the urban environment. 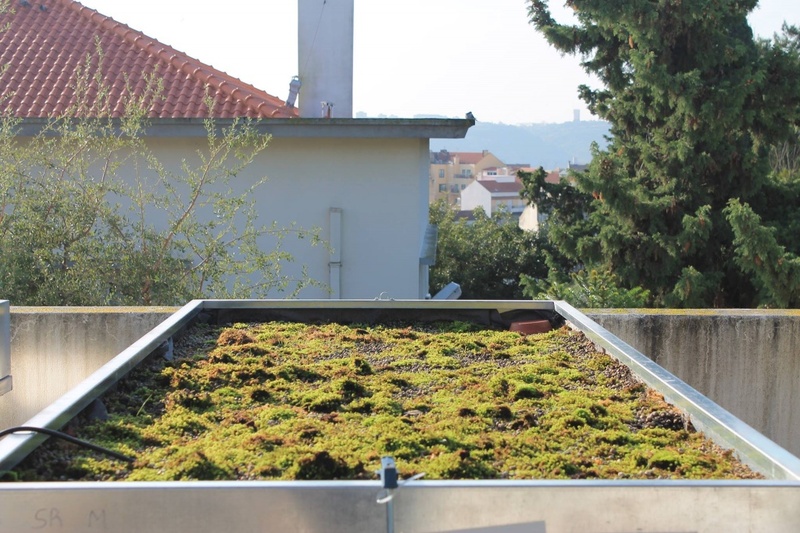 In addition, we want to evaluate the services provided by this green roof composed of mosses in terms of: i) biodiversity; ii) infiltration and water retention; iii) carbon and nitrogen sequestration; iv) air filtering capacity v) temperature regulation of the urban structure. To this end the project will follow a five step program: i) collection and selection of mosses from different climates and origins in Portugal; ii) promotion of growth of selected mosses under controlled environmental conditions; iii) installation of experimental pilot green roofs based on moss coverage; iv) evaluation of the services provided by this green roofs namely its aesthetic value; v) feasibility of the developed idea for creating a spinoff. Science and Technology Foundation (PTDC/ATPARP/5826/2014). Faculty of Architecture, Computing & Humanities The University of Greenwich (ACHUOG); Instituto Superior de Agronomia and Neoturf Construções e Manutenção de Espaços Verdes, Lda.